Join an art tour and discover some of NYC's best public art works in places like the High Line and the subway. Take one of these walking tours to discover some of New York's best pieces of public art. Spanning both recurring and one-off art tours, you'll see works in Soho, on the High Line and Harlem. Artist and designer Sascha Mombartz points out 22 pieces on this walking tour. Some are easy to miss, like the 1984 carving of a continuous line chiseled by Ken Hiratsuka into a sidewalk on Broadway at Spring Street. Participants also see well-known public art, including a 1973 minimalist piece by Forrest Myers in which 42 seafoam-green pylons protrude from an eight-story blue wall. The jaunt finishes at the watering hole where Abraham Lincoln once sunk a cold one in 1860, McSorley’s, with a chance to buy your tour guide a drink and talk further if it’s not too crowded. Meet outside Ground Support Café, 399 West Broadway at Spring St (artwalknyc.com). Various Sat 2–3:30pm; $50. Reservations required. During this private two-hour saunter, Alfred Pommer, a former supervisor for the NYC Parks Department, explains the history of notable works such as Nina Saemondsson’s ten-foot-tall 1930 Art Deco sculpture of a winged woman, which adorns the canopy of the Waldorf; and the giant, colorful 1987 sculpture by Frank Stella hanging in a lobby next to the Citigroup Building. Pommer is steeped in New York culture and history, and offers 26 different private and public walking tours throughout the city, including a private one one that explores the public art of Rockefeller Center and a public gargoyle tour dedicated to the stone creatures lurking on buildings like the Flatiron and Croisic. Meet at 300 Park Ave between 49th and 50th Sts (nycwalk.com). Private tours: $120; individual or group tours of up to 15 people available. Reservations required. Public tours: $15. 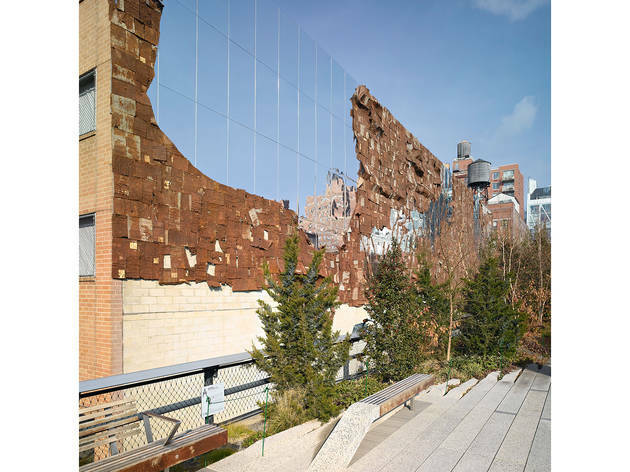 In addition to its weekly Tuesday tours (meet on the High Line at 14th St; 6:30–7:30pm, free; beginning May 7) covering the design, development, food and art of the elevated park, Friends of the High Line offers the occasional special tour. The next art-related edition will be held in conjuction with the Brooklyn Museum and explain the story behind the green space’s largest installation to date, Broken Bridge II, a 37-foot-high and 157-foot-wide sculpture by El Anatsui, reigning between West 21st and 22nd Streets. Made mostly of tinfoil and mirrors, the work debuted at La Triennale festival in Paris in 2012. By reconfiguring the piece for NYC, the Ghanian-born and Nigerian-bred artist hopes inhabitants will view both themselves and their culture through the lens of his work over time and observe the changes reflecting back upon them. Location revealed to ticket holders; visit thehighline.org/events for more information and to purchase tickets. May 15 6:30–7:30pm; $15, High Line members $10. Ride the subway with Bronx-born guide Darryl Reilly to discover the riches of art underground. This three-hour escapade stops at Keith Godard’s whimsical Memories of 23rd Street, a collection of mosaics depicting colorful chapeaus worn by celebrities who frequented the area between the 1880s and 1920s, including Harry Houdini’s upside-down hat and Gertrude Vanderbilt Whitney’s colorfully adorned cap. The group alights at 14th Street–Eighth Ave to view Tom Otterness’s Life Underground, a series of miniature, stylized bronze sculptures such as an alligator in a manhole and a cop watching a homeless man sleep. Meet inside Così café, 1633 Broadway between 50th and 51st Sts (nycsubwaytour.com). Mon, Fri 2—5pm; Tue–Thu 10am—1pm. $25. Reservations required. Join museum educator and guide Emmy Goldin on this family-friendly tour of Latino history and culture via uptown murals of political figures, artists, poets and activists. Learn the significance of stops that may include Remembering Julia, a mosaic by Manny Vega that honors the late Puerto Rican poet Julia de Burgos; and Dos Alas, and Ricanstruction Netwerks and Puerto Rico Collective’s Dos Alas, a mural featuring two prominent Latino activists, Che Guevara and Puerto Rico’s Pedro Albizu Campos. The walk may also take in Hank Prussing’s The Spirit of East Harlem, an iconic painting of neighborhood residents from the ’70s playing basketball, dominoes and musical instruments. Meet at the Museum of the City of New York, 1220 Fifth Ave between 103rd and 104th Sts (mcny.org). May 5 noon—2pm; free with museum admission (suggested donation $10). Reservations required.